OXFORD, Miss. – State senator, state representative, pharmacist and University of Mississippi alumnus – of all Percy Malone’s titles, the one which he is proudest of is advocate. The former Arkansas state senator and 1965 pharmacy graduate is the School of Pharmacy‘s 2018 Alumnus of the Year. He has spent his career fighting to represent the interests of those who may be otherwise overlooked: namely, children, sick or incapacitated people and those living below the poverty line. Originally from the small Mississippi Delta town of Rosedale, Malone’s parents had little education, but a strong work ethic. As a sixth-grader, Malone began working as a soda jerk in his local pharmacy, Lewis Drug Store. It was there he decided he wanted to become a pharmacist. After graduating from Rosedale High School, he completed his pre-pharmacy requirements at Delta State University before coming to the School of Pharmacy. Malone recalls that he was not prepared for college, but that his professors at Delta State and Ole Miss spent extra time with him. His sister, who worked at a factory, gave him a credit card to buy gas for his old car. When he left Ole Miss on weekends to work at Lewis Drug Store, his mother sent him back with enough food to eat for the next week. From there, Malone went on to become one of the state’s top pharmacy innovators. 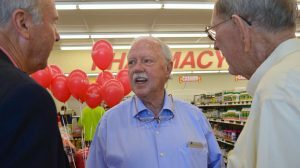 He founded AllCare Pharmacy in 1972, which has grown to more than 17 community pharmacy locations across Arkansas. He had one of the first pharmacy computer systems in Arkansas and expanded his business to fill prescriptions for long-term care facilities, assisted living facilities and correctional facilities, as well as specialty prescriptions for complex diseases. As a pharmacist and businessperson, he focused on finding ways to be more efficient and patient-oriented. Malone’s concern for the consumer stemmed from the understanding his background had given him of not being able to afford medicine. In an effort to do more for patients, he ran for state government, and in 1995, began his first of three terms as an Arkansas state representative. As one of the only people in the Arkansas Legislature at the time with a health care background, he also advocated to allow pharmacists to administer immunizations and worked to pass evidence-based medicine in the state. Besides health care advocacy, Malone stumbled upon what would become his other focus while in the Legislature. On his first day as a state representative, Malone read a news article he couldn’t forget about an abused and neglected child. From then on, he made it his mission to introduce at least one measure per legislative session aimed at protecting children. Along with his wife, he helped expand the Children’s Advocacy Centers of Arkansas, where children could go to report abuse. 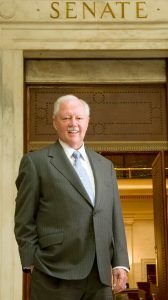 Because of this, as well as the numerous child protection laws he initiated, the Children’s Advocacy Centers of Arkansas honored him with the first Senator Percy Malone Child Protection Award in 2010, which is given to someone in Arkansas each year. He spent 18 years in the Legislature, eventually becoming a senator for five terms, befriending then-future President Bill Clinton and continuing to fight for the vulnerable. He also has been lauded for his work pioneering innovative health care solutions that benefit assisted and long-term care facilities and their residents. Malone’s generous spirit and care for those in need is well-known throughout the state. Misty Huerkamp, staff pharmacist at AllCare Pharmacy, is an Ole Miss pharmacy alumna and Arkansas native who grew up hearing about Malone. Another Ole Miss pharmacy grad, Lauren Lyles, met Malone in 2014 during her second year of pharmacy school at the National Community Pharmacists Association annual meeting, after which Malone became a mentor to her. Malone credits his Ole Miss education and the people he’s encountered for helping him to reach a place where he can freely give back. Malone will be honored Saturday (April 21) with the Alumnus of the Year Award at the School of Pharmacy’s awards banquet and reunion dinner at The Inn at Ole Miss. “The School of Pharmacy is humbled and honored to call Percy an alumnus,” said David D. Allen, the school’s dean. “He is beyond deserving of this award, not only for his contributions to our profession, but for the way he embodies the Ole Miss spirit.